The Jameson’s Journey blog was created for our son Jameson. 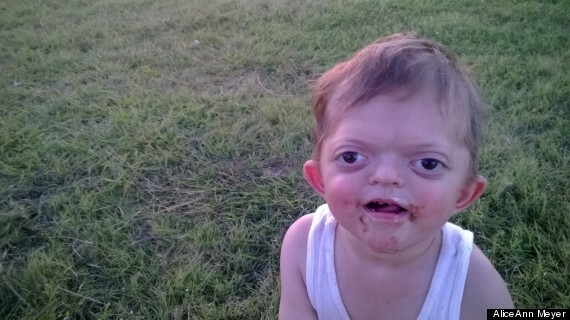 He was born with syndromic craniosynostosis. 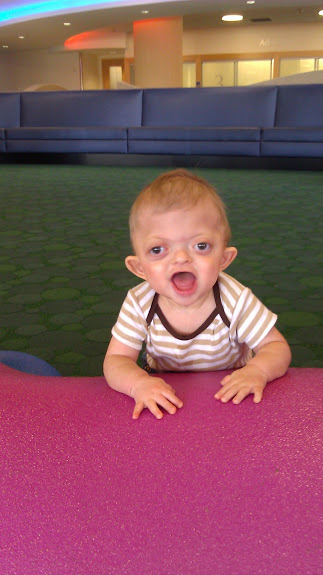 Jameson has a very rare disorder, and we are currently waiting for his test results to come back, but we believe he has Pfeiffer Syndrome. 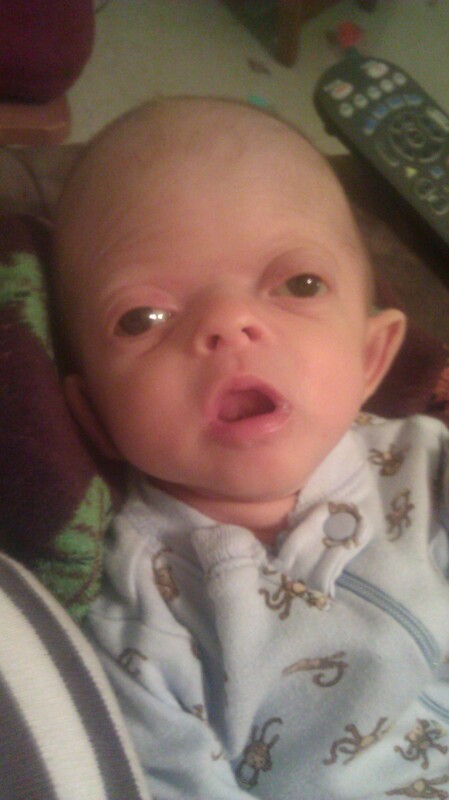 Jameson was born January 7, 2012. I had a completely normal pregnancy and we weren’t expecting anything other than a 100% completely normal baby. To say we were surprised is an understatement. I never once in my life imagined I would be the mother of a child with craniosynostosis. But in the few short weeks I have gotten to know the dear, sweet soul that is Jameson I now can’t imagine my life without him. Jameson was born into a very loving family, he has an older brother that is already protective over him and a mommy and daddy who love him dearly. Not to mention the numerous cousins, aunts, uncles and grandparents that love him! We have already learned so much about Jameson’s condition, something I honestly knew nothing about 3 weeks ago. We hope that sharing our experience and Jameson’s journey throughout this process will help other families and children in similar situations as well as to help educate and spread awareness as we ourselves continue to learn along the way. Next Post: Suffering From Chocolate Addiction? Self Help Advice. It’s up to us to teach them these things often they just don’t realize the hurt they cause. I’m glad this boy has a loving family, in China such a child would generally be sent to a home or even abandoned for fear of shaming his family – so sad! Just a little boy …. who is different! I have felt the pain of being different also. It’s freakin’ hard, I’ve been trying to teach my kids that just because someone doesn’t like us, or rejects us, doesn’t mean we have to stop loving them and start hating them. I feel like you have to break that cycle somewhere. I try to reinforce empathy when my kids seem to be lacking it. It does take more work than simply telling them not to say mean things to others. This is so true and such a lovely way to make people aware of the difficult world kids who are different live in. I am actually moved to tears right now. I taught little kids and they can be super cruel to the little one that is different or who just likes something they dont. It always upsets me a lot and I think all parents should read this and teach their kids to accept different people and to not point it out or make fun of them. This is beautifully written, Alice Ann. Thank you for reminding me that God makes us all with a purpose. I love the picture of Jameson with s’mores all over his mouth. I can see a little mischief in his eyes. I am glad that you suggest that people bring their children up to meet him. My kiddos are grown with grown children of their own now, but I am taking that bit of advice for my own. In the future, I shall go introduce myself and meet the one, anyone, who seems different. Thanks for sharing your heart. Please look at this face. Look into the eyes of this little guy and then read about Jameson. J’ ai été très touchée part cet article… Et vous ? Life is full of surprisingly good things. It is sad that people sometimes can’t understand that what is on the outside sometimes isn’t on the inside. I was very touched by this post. A great adjustment for the whole family when a baby arrives and is not exactly what one expected. Patience and love are the antidotes to conquer the outside waves of misunderstanding. I just had to reblog this post. Jason was a victim of people staring at him, looks of disgust because he made loud sounds and people purposely walking away from him as if they would actually catch what he had. I even had a family member do this as well. A great post. Your son is beautiful! I was a mother of a special needs child and I can definitely relate. I reblogged in order to help spread disability awareness. Jameson is a full-out cutie-pie!!! I love your approach to anyone who may appear to be “different”—just go up and meet him/her. This is such a wonderful post, and your boy is amazing. Thank you for sharing this beautiful post with us all.